Jack Glover respects the long history of success at the NTDP and looks to add his own mark moving forward. Photo by Tom Sorensen. The Glover parents faced an unexpected departure this past August when not one but both of their sons moved away from home. For Andrew Glover, the move from their Golden Valley, Minn. home to attend the University of Notre Dame was expected; after all, he had graduated high school. However, the family also had to bid farewell to Jack Glover, who is 2 1/2 years younger than Andrew, when he moved to Ann Arbor to join USA Hockey's National Team Development Program. Glover draws inspiration from assistant coach John Gruden. Photo by Dave Reginek. 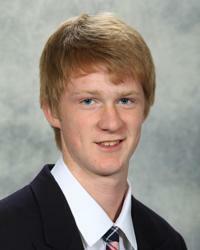 Jack started his hockey career when he was 4 years old on the outdoor rinks in Minnesota. “My dad got me into it, and my older brother played too,” he said. “I wanted to be like [Andrew] when I was a little kid, and all my friends were doing it. It is the culture in Minnesota. Every kid has to try hockey. I tried it and loved it. Glover has grown into a 6-foot-3, 185-pound defenseman. He has patrolled the blue line his entire career. 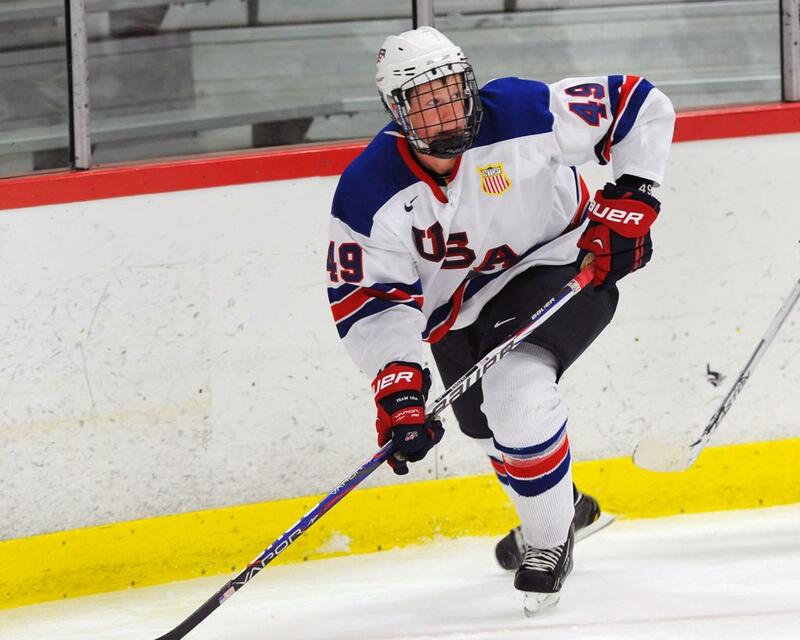 At the NTDP, Glover said he has greatly improved as a player, which he credits in large part being able to work with assistant coach John Gruden. Plus, Glover has taken to heart some words of advice from Gruden. Each day when Glover walks into the NTDP facilities, there are constant reminders of the players and teams who came before him and what they have done. It helps him realize what he is working towards on a daily basis. “It’s inspiring,” he said. “It’s the standard they set since their first year here. When you see those names, you know what is expected of you and you know who has been here and that they went through the same thing as you — the same kind of struggles. Glover finished his first season with Team USA appearing in all 56 games while posting six goals and 20 points. As he closes out his first year with the program, he said he realizes the privilege he has to wear the sweater of Team USA.